Jack called yesterday and asked if he could spend the night. A lifelong friend was gravely ill and he would not make it for dinner, but he looked forward to spending the night and breakfast in the morning. He remembered my husband’s birthday is this weekend and even brought a gift in the midst of a very heavy evening. His friend went home to Jesus at 10:30 pm. Jack is a Texan. 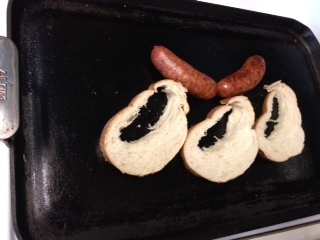 How do you cook breakfast for a Texan when you are Iowan? I began cooking around 7:30am and everything was ready in 15 minutes. 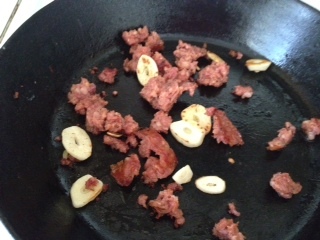 Crumble 1 sausage in the bottom of your frying pan, turn up heat and slice garlic very thin and place all around the pan. Lower heat to 4 for gas. Scramble two eggs into the pan…toss generous amounts of cayenne pepper on everything. Add Cilantro and perhaps some sage or thyme…whatever is available and garnish your plate with salsa. My husband makes a green chili sauce that is perfect with eggs. 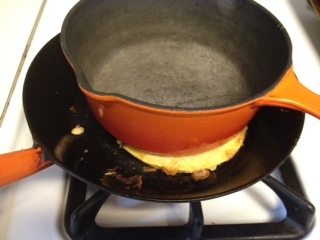 Place toast in a covered basket to keep warm and two corn tortilla’s for the eggs. 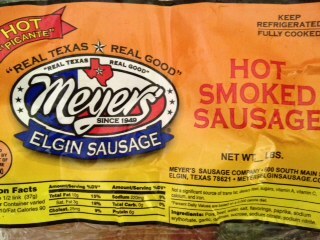 Elgin Sausage is the only sausage we serve in Texas. 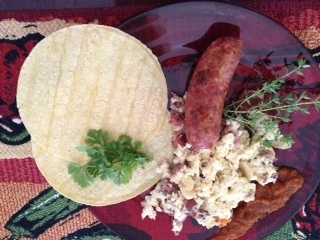 Surprise your family with breakfast tacos and a little latin music. I used my phone and played it while everyone enjoyed the fun morning meal. 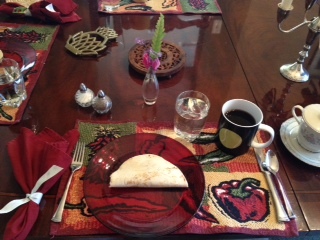 My sister Peg sent the lovely placemats with peppers and chilis. The night before cook sausage and store in the frig. I followed the directions on the Jimmy Dean package. Cook Pinto beans with a little of the leftover juice from the sausage, salt and pepper to taste and as they become a bit mushy. Drain all water from pinto beans and store in the frig. Finely chop lettuce and store in the frig. Place all ingredients on the tortilla fold and weight with a heavy pan, toast in a frying pan with just a small amount of oil. We will be enjoying many great dishes this weekend, but I thought I’d share a simple one I prepare for my family for breakfast. Prepare rice and beans at least a day before. I am not one to veer from the recipe printed on the bag. 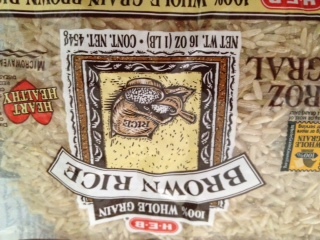 Buy one bag of black beans and one bag of whole grain brown rice. Chop everything and place in a jar squeeze enough lime to make it have a slight kick in flavor and salt and pepper to taste. Spray a little olive oil on frying pan and place tortilla and layer in a little rice, beans, eggs, pico de gallo and top with another tortilla and weight with the heaviest pan available. 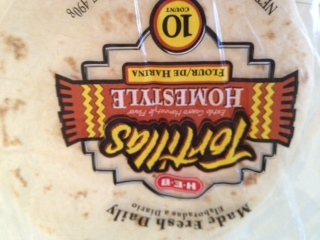 My family likes a little cheese on theirs but we have this without cheese and it is muy deliciouso either way. I served it with a kale juice as a nod to my friend Margaret Turewicz. We spent ten days in Puerta Vallarta and she drank Kale juice every day. Our daughter and I could hardly watch her drink it, but now we understand how great you feel. 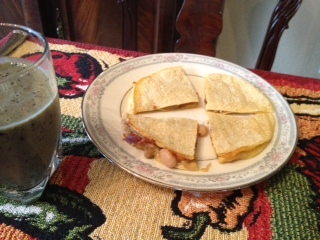 I mix mine with just a little fruit…apple or berries of any kind in the blender to hide the bitter bite of the kale.